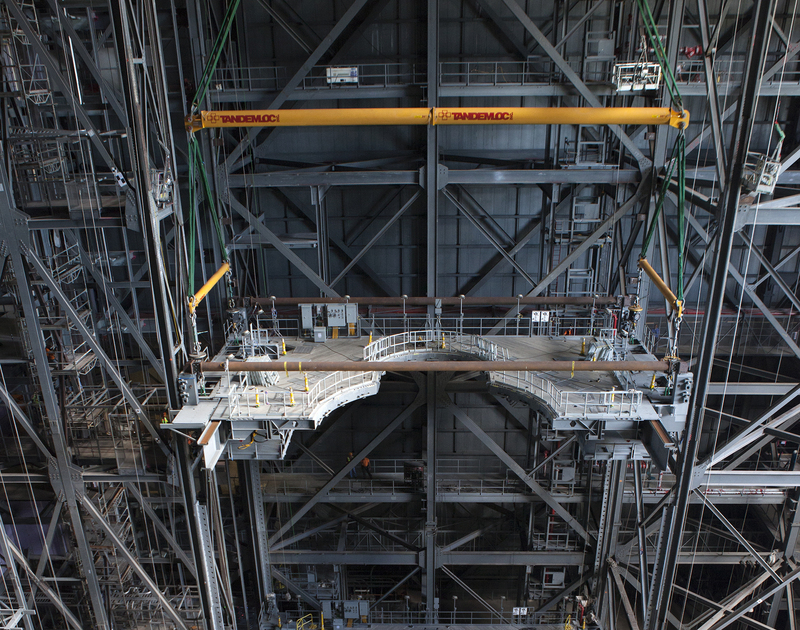 The G-level work platforms for NASA’s Space Launch System (SLS) rocket, were installed this week in High Bay 3 of the Vehicle Assembly Building (VAB) at NASA’s Kennedy Space Center. A heavy-lift crane was used to raise G south and G north platforms up from the transfer aisle, then over and down to about the 14th floor level for installation. The G-level work platforms are the fourth of 10 levels of work platforms that will surround and provide access to the SLS rocket and Orion spacecraft for Exploration Mission 1. The Ground Systems Development and Operations Program is overseeing upgrades and modifications to VAB High Bay 3, including installation of the new work platforms, to prepare for deep space missions, including NASA’s journey to Mars.